As I am preparing to give the Camembert workshop in Canberra on 16th of November, I thought it would be good to put down some basics. 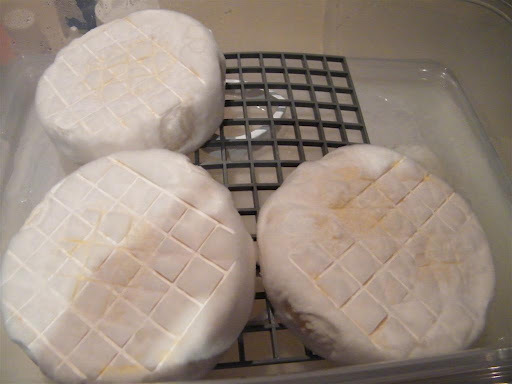 When I first tried to make Camembert (Cam for short) couple years back, I was reading horrible results like slip-skin, ammonia smell, pungent aroma, contamination during the aging etc and was thinking that, this must be one of the hardest recipes (don’t get me wrong, the hardest was Comte) I was going to try. After much reading and trying to put together a recipe with floc, pH and correct ripening requirements, I realized that, it wouldn’t be so hard to make this cheese. As I am an engineer, technicality of making this cheese; once written down to every details, didn’t scare me much. Once I have got the confidence, I started gathering necessary cultures. There are 2 cultures that will grow that white musroomy skin on the cheese. These are Geotrichum candidum and Penicillium candidum. While it is possible to harvest these cultures from shop bought cams or bries, I recommend buying the actual culture from cheesemaking suppliers. I will explain why. Most slip skin problems occurring during the aging are the result of too much moisture left in the cheese that give lactic acid bacteria more food as lactose and before PC or GC takes over. Availability of lactic acid overworks the P and G Candidum. Also ripening temperatures during the warmer months will accelerate this process. There are two ways of attacking this problem to solve. First of all get your temp and humidity controlled environment for ripening into a stable level. And the second is to use a good culture strain to prevent slip skin. 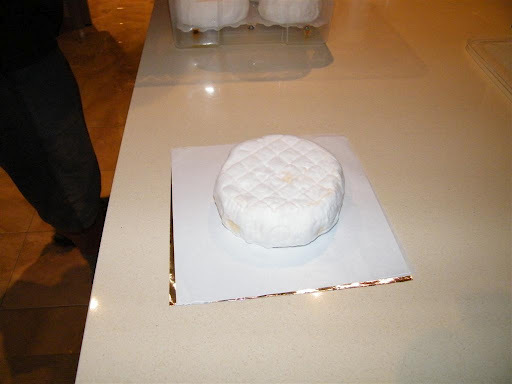 As this cheese is a fresh and high moisture cheese, contamination problems are also very prominent among the artisan cheesemakers. If you are trying to harvest white mould from shop bought cams and bries, you may be inviting other moulds and bacteria unknowingly, which will create problems with your making. I use mixture of fresh, raw cow’s and goat’s milk for my cams. I have tried using lipase with cow’s milk only but my taste buds were not agreed. If I have the chance of using only goat’s milk, I would go for it. Whatever the milk you use, if you don’t trust the source or getting shop bought milk, please pasteurize before use by keeping it at 65C for 25 minutes and cooling it to renneting temperature immediately in an ice bath. I don’t add any extra cream as I don’t have a source of cream but if you want to make a double brie, you may try. 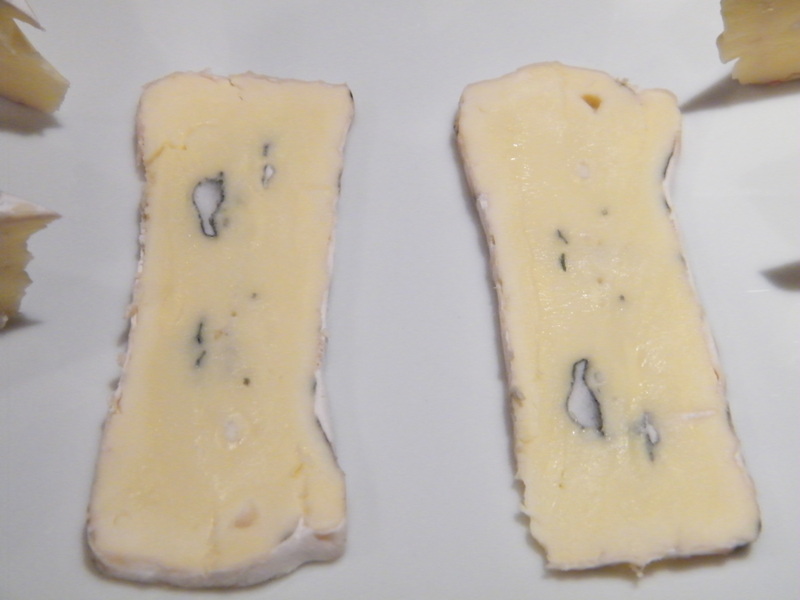 The starter culture for this cheese is mesophilic. Any mesophilic will do. Diacetylactis variants will give a buttery flavor and if you are trying Cambozola, I recommend a gas producing starter like Flora Danica or adding yeast specifically designed to make holes in cheese (not P. Shermanii like in Swiss cheese). 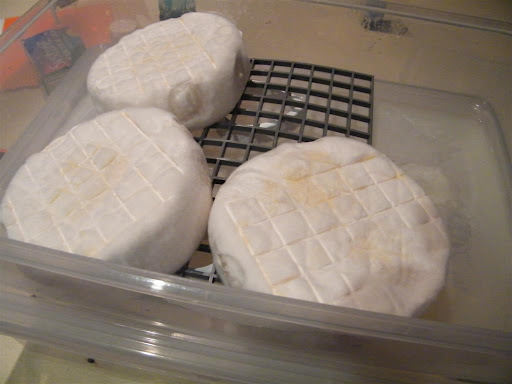 One day I used only goat’s milk for Cambozola (love child of Camembert and Gorgonzola) and the resulting cheese was one of the best aromatic cheeses I have ever made so much so that I can not eat normal cam/brie any more. Forget about bamboo mats and sandwiches. Hard to use, hard to manage and harbors unwanted bacteria. 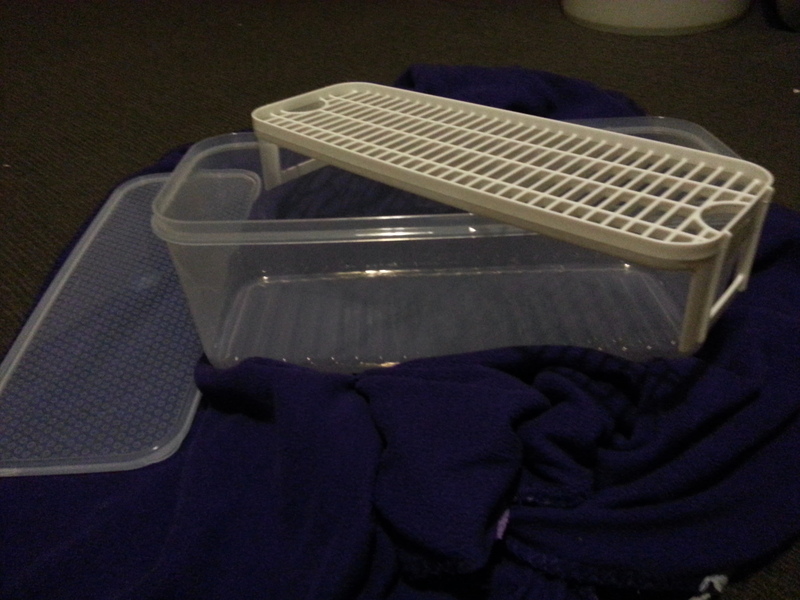 I am using a single plastic draining basket. They are cheap, works well and stack-able for extra draining. I bought 7 of these and use it for feta and cam. They are very easy to use. Most recipes on the internet will tell you to dry salt the cam with about 3% of the cheese’s weight. As I make cheese at home, I always have brine available and I always brined cams rather than dry salting. Cam is a small cheese and 2 hours of brining in a saturated brine will do. 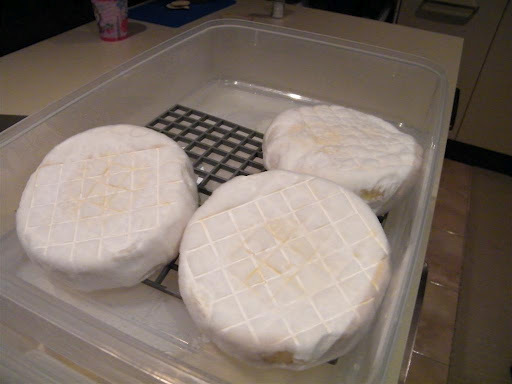 Brine bowl/bucket should be kept in the ripening fridge at about 10 to 14C and top surface of the cheese should be sprinkled with salt to prevent contamination and also should be flipped after first hour and sprinkled with salt again. Flipping is necessary to get the salt sucked in equally on both sides. 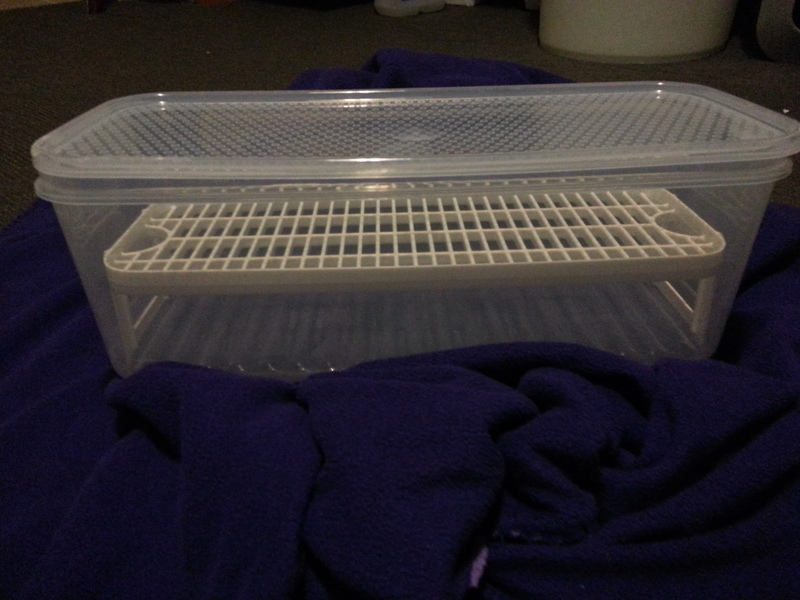 There are food grade plastic boxes available with half way shelves in them. The one I found in the picture takes 3 cams in it and perfectly fits in my cheese fridge. Also because the wholes are larger, it does not interfere with the P.C. development. This humidity chamber shall be kept in the cheese cave and the humidity should be contained around 95%. 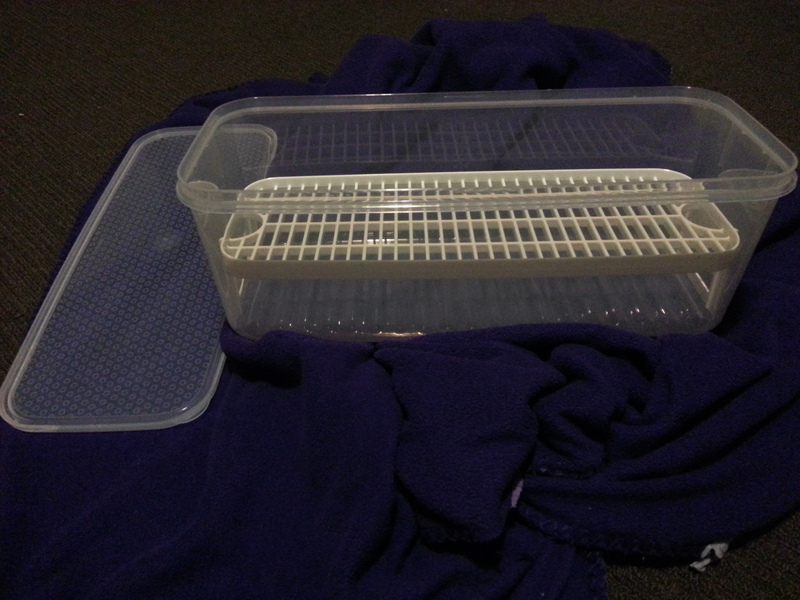 The box should not develop water beads on the sides and lids and during the first couple of days; it should be drained and wiped with a cloth (cloth dunked in 1:1 vinegar, methylated spirit solution to sterilize). The cheeses should be flipped everyday once or twice to assist P.C. development. 8 liters of milk will give you about 5 cams depending on the size of baskets you use. Only goat or half goat half cow milk will do. Make sure you also have enough ripening containers. PC or GC or mixture of these. If pasteurizing your milk, cool it down to 30C in an ice bath and keep the temp constant through out the making. Add your starter and PC or GC into the milk and stir well. Wait about an hour or if you have a pH meter, wait till you read pH6.4. During the milk ripening period above, stir the milk every 15 minutes to get the culture distributed evenly. Add diluted rennet and stir well. Make sure rennet is not expired and the water used for dilution is filtered and does not contain chlorine and other nasties. Rest the milk for an hour and keep the temp constant at 30 to 32C as much as you can. Running kids, pets should be prevented. If the temp drops, do not heat it on stove as the heat will not distribute evenly. Use a hot water bath in your sink. After an hour, check for clean break, If the curd is breaking cleanly, it is time to cut. Cut the curd to about 2cm cubes. Stir with a ladle from bottom to top and find those bigger curds to cut them. Once you finish cutting, let curds “heal” for 5 minutes. Stir every 10 minutes to break the curds (as they stick together again) gently. 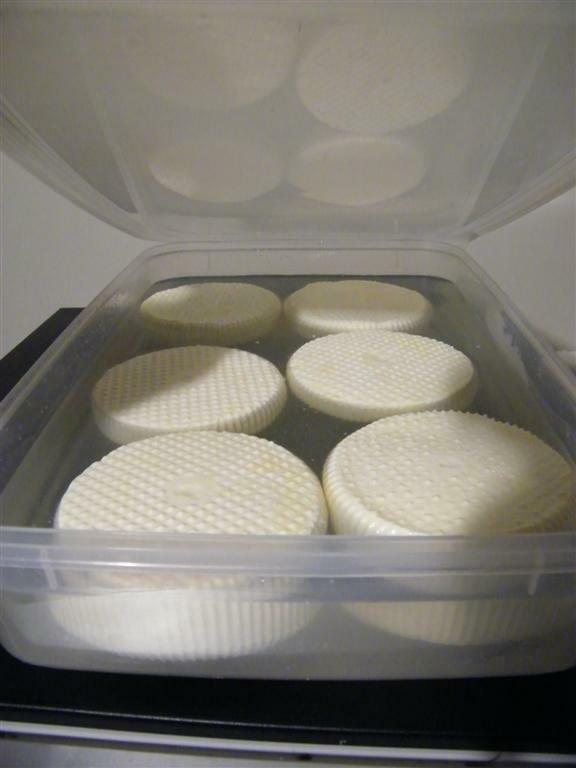 Check the look and feel of the curds, after a while, they should shrink, firm up and get a glossy look. If they are still big and do not shine; continue stirring every 10 minutes. 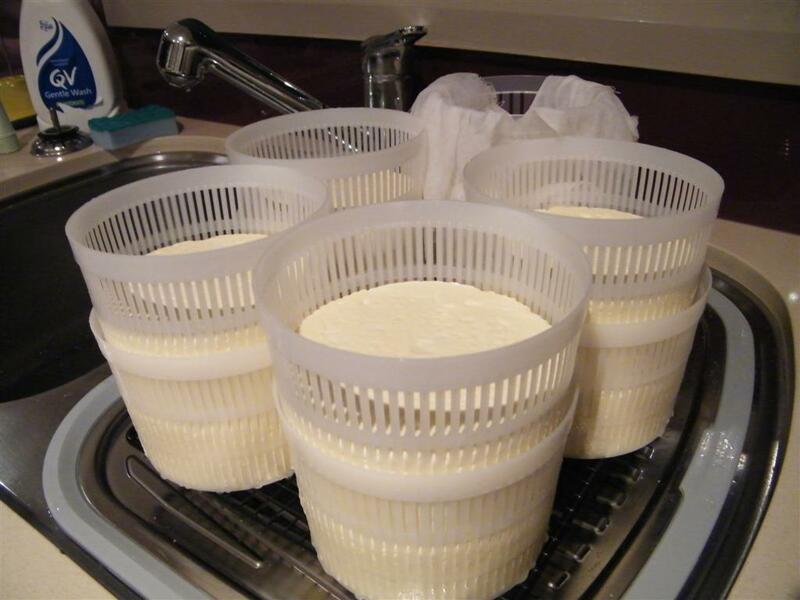 Once you get that glossy look, remove the whey to the level of curds and start filling the baskets with curds. The baskets I am using are 8cm tall. So I fill them up to the top. When the curds drained, they come to around 3cm tall disks which look like the commercial cams. Drain at room temperature without any weight. To be honest, I stack 2 baskets on top of each other and then flip the cheese regularly (if it can be handled easily) in the baskets as well as taking the top basket to bottom. This speeds up the draining stage. After draining overnight and both sides are flat and uniform, take them into brine for salt infusing. Salt helps the aroma to develop. If dry salting, make sure you use about 2% or 3% salt compared to the weight of each cheese. Brine time is 2 hours with flipping after first hour. 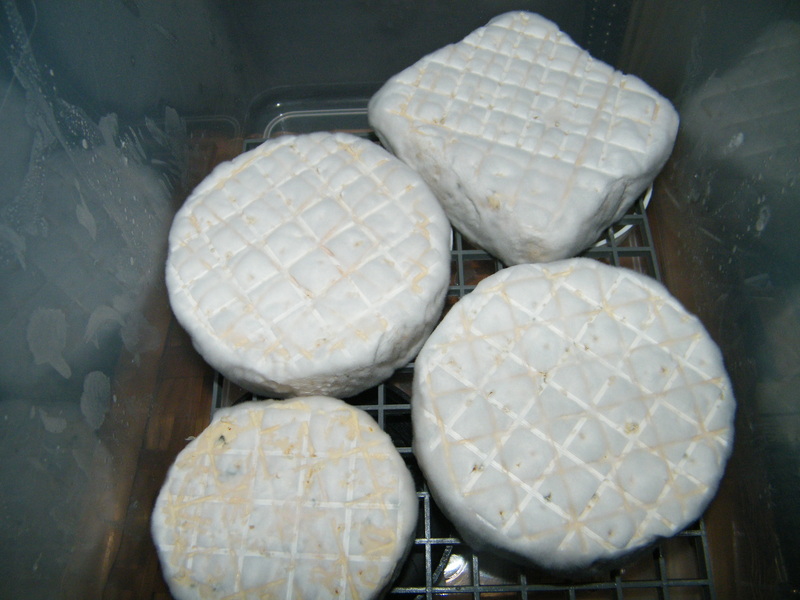 Once they are brined or dry salted, they are ready to go into cheese cave in a humidity chamber. 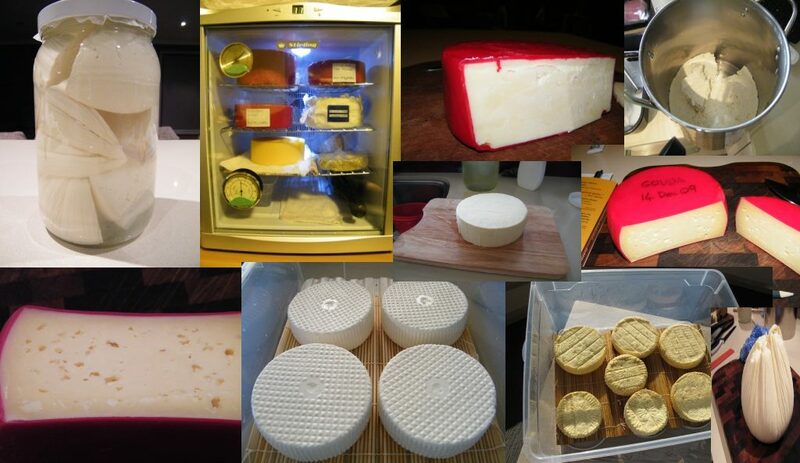 Cheese cave should be adjusted to between 10 to 12C and the humidity will be kept constant by the boxes we use. 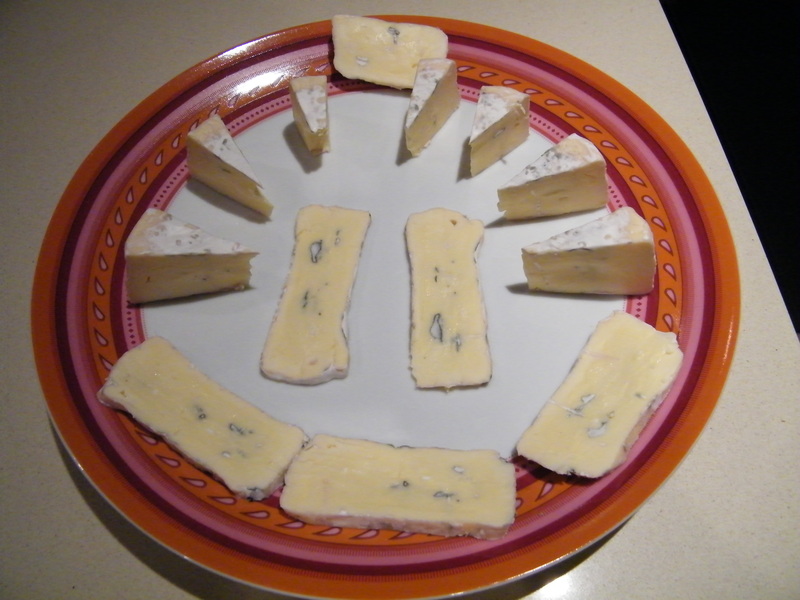 Place the cheeses in the fridge and flip them everyday. After couple of days, you will see white fury skin developing. Drain excess whey in the containers and wipe the boxes to remove water. 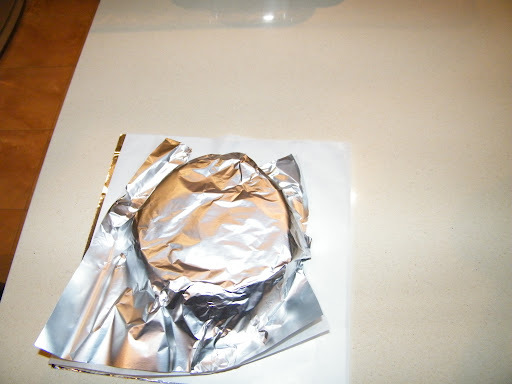 Once the entire cheese surface develops white mould (about end of first week), wrap them in cooking paper and aluminium wrapping. Place them in your normal fridge at 4C for further aging. The entire aging is about 4 weeks depending on temperature and moisture level in the cheese, starts in the humidity box till it finishes in refrigerator. 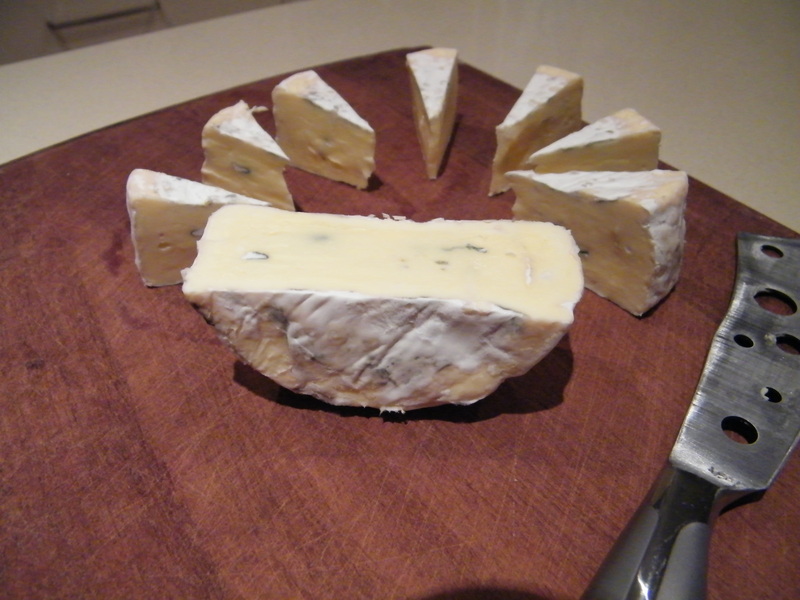 Test the cheese by pressing the centre gently in its wrapping. If it is soft to touch, consume. 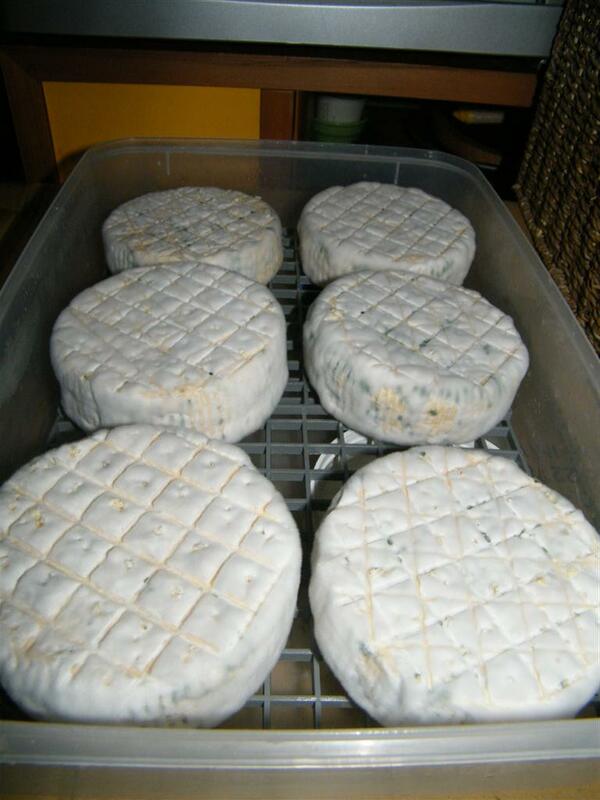 Try washing the cheeses with unpasteurized beer or wine every second day during the mould growing period. Wash the cheese with a Brevi Linen morge every day. Close up blue mould. The wholes were isolated but P. Roqueforti still grew. Paste is not gooey but still soft. You would expect this with Cambozola. Bu peyniri yapmayı seviyorum. P. Candidum küfünün büyümesini görmek bana çok haz veriyor. Sonuçlar da iyi olunca hem hanım mutlu oluyor hem de ben. Nem kutusunda kuzu gibi yatıyorlar. Birazdan özel perfore kağıtlara sarılacaklar. Kağıtların boyu biraz ufak geldi. Bir kaç hafta daha buzdolabında durduktan sonra tamamı ile olgunlaşacak ve yemeye hazır olacak.